LUCENA CITY – Over 8,000 community frontliners against all forms of illegalities called Provincial Union of Leaders against Illegality (PULI) in Quezon province greeted the arrival of President Rodrigo Duterte on Tuesday to support the president’s campaign for peace and order in the communities. “Binuo po namin ang PULI, mahal na Pangulo, upang tumugon sa polisiya na labanan natin ang kriminalidad, ipinagbabawal na gamot at insurgency sa Lalawigan ng Quezon. Because of the PULI, we have partnered with the PNP, and led to 2,905 successful operations. 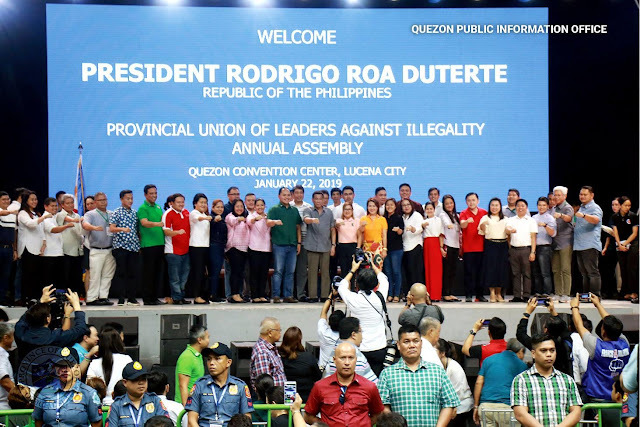 This is the way we answered the President’s call towards genuine change, peace and order in the Province of Quezon,” said Quezon Gov. David ‘Jayjay’ Suarez at the Quezon Convention Center where PULI members have gathered for their annual assembly along with members of Luntiang Katipuneros, a province-wide group focused on environment protection. Duterte, who was invited by Suarez, came with former Special Assistant to the President, Christopher ‘Bong’ Go and Presidential Adviser for Political Affairs Francis Tolentino who are both running as senators in the May 13, 2019 midterm elections. Also attending the event were vice gov. Samuel Nantes, ALONA partylist Rep. Anna Villaraza Suarez, House Minority Floorleader Danilo Suarez, former 3rd District congw. Aleta Suarez, provincial board members, mayors, barangay officials, PNP-Quezon and Southern Luzon Command officials and other selected guests. PULI, a takeoff from the province’ hero Hermano Puli who fought against Spanish authorities, is a program started in 2017 which supports the national government thru the Community Mobilization Project of PNP CALABARZON (Cavite, Laguna, Batangas, Rizal, Quezon). It aims to establish a grassroot-based support system at the barangay level in the fight against all forms of criminalities in the entire province. According to the Quezon police provincial office, they have launched over 2,000 succesful anti-crime operations in various parts of the province owing to the valuable information extended by PULI members. The campaign against crimes and corruption has been the centerpiece of the Duterte administration particularly in its War on Drugs. In his speech at the jampacked event, Pres. Duterte vowed to prioritize in his last 3 years of his term to continue his security protection and peace and order drive for all the Filipino people. “The Presidency is a gift from God. Bigay talaga ng Diyos yan. And my gift to you is itataya ko talaga ang buhay ko pati my freedom. If it gets to a worse scenario that I go to prison, I will go to prison. Basta, gawin ko ang gagawin ko, because I have to protect the Filipino and preserve the nation.” concluded Duterte in his speech.